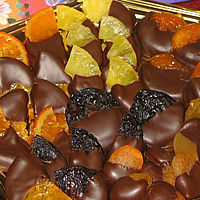 Imported glazed fruits are hand-dipped in creamy, bittersweet, Belgian chocolate. Choose from Australian glazed orange slices, apricots, pineapple and ginger. We also have prunes, orange peel, and craisin clusters. Half pound, one and two pound boxes available. $36 per pound; $22 per half pound. Assorted or single fruits.